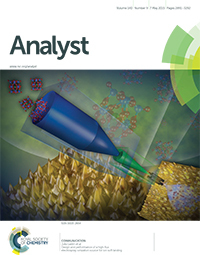 Artwork based on the study appears on the May 7, 2015, Analyst cover. The art was created by Cortland Johnson, PNNL. Reproduced with permission from The Royal Society of Chemistry. Enlarge Image. Results: In 90 minutes, scientists may now create designer surfaces and structures that once took 10 hours, thanks to a new high-intensity device constructed at Pacific Northwest National Laboratory. The instrument softly deposits up to 1 microgram of mass-selected ions a day onto a targeted surface. While the amount might seem small, it is enough to build well-defined samples for detailed studies that allow scientists to correlate structure with reactivity and charge storage capacity. 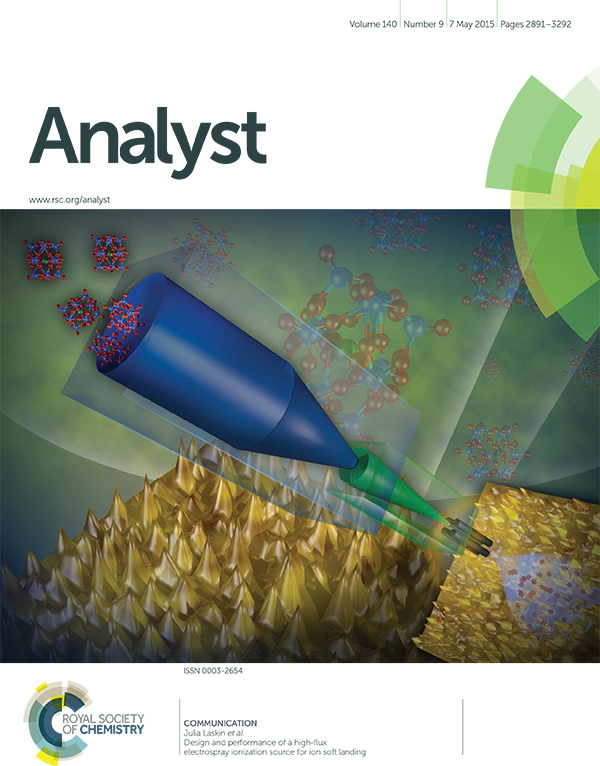 Artwork from this study graces the cover of Analyst. Why It Matters: Creating catalysts that produce biofuels on a massive scale requires designing and testing different well-defined materials. The same holds for long-lasting batteries and efficient capacitors. The challenge is creating the desired sample quickly. With the new soft landing instrument, simple surfaces and complex architectures may be built to screen for properties -- such as the electrochemical response important in supercapacitors, sensors, and batteries -- at speeds not possible before. Methods: The new device achieves its high deposition rate using two sequential ion funnels and a quadrupole mass filter. High deposition rates were achieved when the ions were sent into the system using wider heated inlets set at a 90 degree angle to the funnels. Using the new system, the team achieved a deposition rate of 1 microgram of mass-selected ions in 8 hours, reducing the time necessary for sample preparation by a factor of 5 to 6. "We can now control complex ionic building blocks and their placement on surfaces at rates that make new fundamental studies possible," said Dr. Julia Laskin, a Laboratory Fellow at PNNL. Now, scientists can deposit sufficient numbers of ions to form mesoscale structures and small devices on surfaces. The reactivity and the energy storage capacity of these architectures will be examined using state-of-the-art electrochemical methods. Further, the structures of deposited species will be characterized using high-resolution electron microscopy techniques, as well as structurally sensitive spectroscopic methods available at several advanced light source facilities. Scientists may apply to use the dual funnel ion deposition system through EMSL's user proposal process. The high-flux soft landing instrument incorporates two ion funnels, with a larger funnel feeding into a smaller one, to achieve an ion deposition rate of 1 microgram per day, significantly faster than previous approaches. This technique creates mesoscale structures that were not feasible before, answering questions that are key in energy production, conversion, and storage. Reproduced from Gunaratne et al. 2015 with permission from The Royal Society of Chemistry. What's Next? The team is using the new high-flux soft landing instrument to create novel materials, including metal oxide clusters that facilitate catalysis, energy storage, and allow investigations of self-assembly at the mesoscale.